The Clay Mathematics Institute (CMI) announced the Millennium Prize Problems to mark the 100th anniversary of David Hilbert's lecture at the second International Congress of Mathematicians. Hilbert's blueprint for mathematics was more influential in setting the direction for 20th century mathematics than any other single event. The Millennium Prize Problems were explained by two of the greatest mathematicians of the twentieth century: John Tate and Michael Atiyah. The lectures by Tate and Atiyah together give a complete description of the Millennium Prize Problems, in a style that is entertaining and easy to understand. 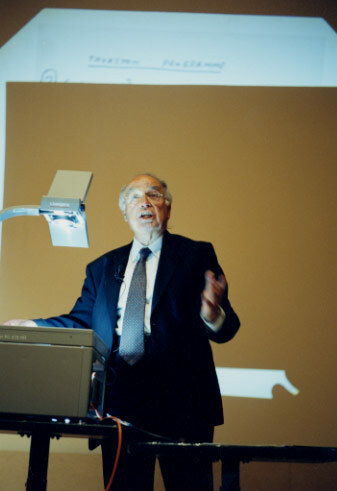 Sir Michael Atiyah is emeritus at the University of Edinburgh, has been Professor at Oxford, the Institute for Advanced Study at Princeton, and at Cambridge University. He is a recipient of the Fields Medal, is former Master of Trinity College Cambridge, and is past president of the Royal Society. Atiyah's work revolutinized mathematics in the twentieth century by unifying the disciplines of analysis, topology, and geometry. Atiyah's lecture discusses four of the CMI Millennium Problems in perspective and places them in context. he also discusses the relevance of the Millennium Problems to a wide variety of mathematics in a friendly, clear style that is at once interesting to experts and accessible to the non-mathematician. Atiyah presents the Poincaré Conjecture, the Hodge Conjecture, Quantum Yang-Mills Theory, and the existence/smoothness of solutions to the Navier-Stokes equations. The Problems described in this lecture are among the most important unsolved problems in branches of pure mathematics including analysis, geometry, topology, and mathematical physics. Solutions of these problems would also have profound implications for fluid dynamics and high energy physics. Atiyah's lecture gives a lucid description of the essential nature and history of these great problems. The lecture itself is a significant event in the history of mathematics, which will be sure to captivate the imagination of anyone interested in the frontiers of mathematics. John Tate is Professor of Mathmatics at the University of Texas, he was formerly Perkins Professor of Harvard University, and is a member of the French Academy of Sciences. He describes in his lecture three Millennium Prize Problems: the Riemann Hypothesis, the Conjecture of Birch and Swinnerton-Dyer, and the "P versus NP?" problem. These questions described are among the most important unsolved problems in analysis, number theory, and theoretical computer science. John Tate's lecture gives a lucid description of the essential nature and history of these great problems. The lecture itself is a significant event in the history of mathematics, which will be sure to captivate the imagination of anyone interested in the frontiers of mathematics. The Importance of Mathematics is a lucid, dynamic presentation of the deep and important question of the relevance of mathematics to society, delivered by one of the best mathematicians of the modern age. Timothy Gowers is Professor of Mathematics at the University of Cambirdge (UK) and a recipient of the prestigious Fields Medal. Gowers gave the Keynote Address at the historic Millennium Meeting of the Clay Mathematics Institute — the very same meeting at which the Millennium Prize Problems were announced. Gowers spoke about the relevance of mathematics to diverse applications citing examples in computer science, finance, and engineering. His theme underscores the unity of different apparently diverse sub-fields of mathematics. His exposition is exceptionally clear and easy to follow, making mathematics accessible to non-experts.